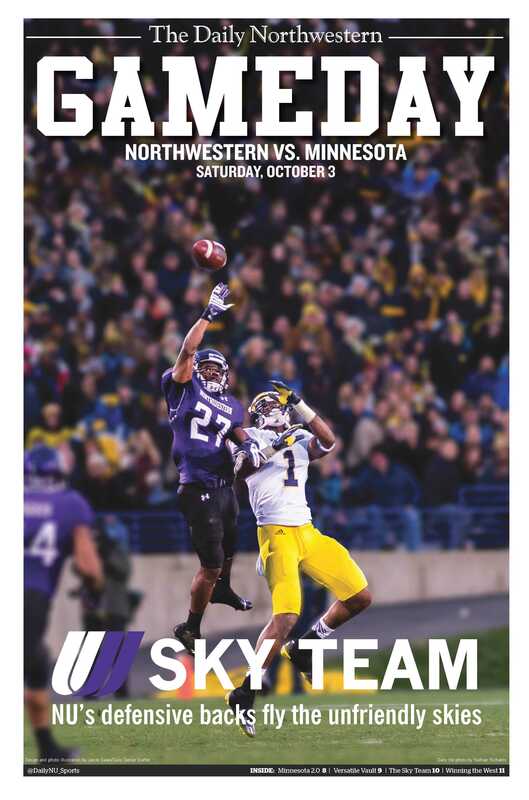 What word best describes the collective personality of Northwestern’s defensive backs? Consider two options. One, offered by sophomores Godwin Igwebuike and Marcus McShepard, is “silly.” After all, the secondary is the position group most prone to crack up during press conferences, arrive to the field on game-day in a bright blue suit (looking at you, Godwin) or dance alongside its 60-something-year-old coach in the locker room after a big win. The other descriptor, proposed by senior Traveon Henry and seconded by junior Matthew Harris, is “swag.” That means talking a big game, backing up the bluster on the field and beating your chest like a maniac when the situation calls for it. It also means lots of accessorizing in the quest for style to match the group’s substance. So far in 2015, the Wildcats’ secondary has played as least as well as it has dressed. NU has allowed the 3rd fewest yards per pass attempt (4.3) and 19th fewest total passing yards (551) of any FBS team, despite often playing with leads. The unit features two cornerbacks — Harris and senior Nick VanHoose — now in their third season playing opposite each other, a starting safety duo that contrasts veteran savvy (Henry) with untamed talent (Igwebuike) and a cast of second-stringers who embrace the “next man up” philosophy. Altogether, the secondary might be NU’s best position group. It’s also likely the most tight-knit and almost certainly the most fun. The 2015 Cats defensive backs are not the first to call themselves the “Sky Team” — Henry says the nickname began with Jordan Mabin, who graduated in 2011, and has been passed down ever since. But, true to form, the current NU secondary reps the moniker with particular bravado. On that front, so far so good. Through four games, none of the Cats’ opposing quarterbacks has thrown for more than 178 yards or averaged more than 5.1 yards per attempt. The two passing touchdowns NU has allowed, both to Ball State, came despite solid coverage from VanHoose. Overall, NU’s passing defense could be the Big Ten’s best. The secondary undoubtedly benefits on the field from its off-field camaraderie. Trust is important at every position but especially in the defensive backfield, where, as Igwebuike puts it, “our mistakes are touchdowns.” If a safety fails to help a cornerback over the top, the result could be 6 points for the other team. A strong relationship between members of the back four is paramount. Entering the season, coach Pat Fitzgerald cited the secondary as a position group he hoped other units would model themselves after, in terms of on-field production but also attitude. To hear Igwebuike explain it, the Sky Team nickname represents more than just tight coverage. It also means confidence, bordering on arrogance. Players at every position on every team talk about how close they are with each other, but by all accounts NU’s secondary takes camaraderie to the next level. The players hang out away from the field constantly and organize weekly Thursday night get-togethers where they eat and watch football as a unit. VanHoose, now in his fifth year in the NU program, says this year’s defensive backs spend more time together than any previous group he’s been part of. Henry says the group’s closeness arrived not entirely by accident but rather through a concerted effort to bond. The defensive backs’ camaraderie begins with a group that arrived in fall 2013 and has “been close since we got here,” in McShepard’s words. Igwebuike, Queiro and cornerback Keith Watkins live together, across the street from McShepard, Harris and linebacker Anthony Walker. They schedule classes with each other and hang out nearly every day, mostly playing NBA 2K video games. With five of the team’s top seven defensive backs, that class forms the core of a remarkably tight-knit unit. If the defensive backs are a family, Henry is without doubt the patriarch. The senior is a team captain and one of the most experienced players on the entire NU roster, and just about every Cats player mentions his name when discussing team leadership. Henry grew up in Lauderdale Lakes, Florida, a relatively low-income city just outside of Fort Lauderdale, but commuted to Pine Crest, a college prep high school, where he starred in basketball as well as football. Henry says associating with people from different backgrounds at home and at school eventually helped him emerge as a leader on a diverse NU team. One day this summer, Henry organized a team-wide scavenger hunt through Chicago, dividing the Cats’ roster randomly to ensure co-mingling between position groups. Players sung the NU fight song in Macy’s and posed for shirtless photos with men in suits, and though an unforeseen rainstorm put a damper on the event, the senior accomplished his objective: bringing the team closer together. Henry commands obvious respect from all his teammates, but the admiration appears heaviest among the defensive backs. Henry seems to recognize his impact on younger defensive backs and take his leadership role as seriously as anyone on the roster. Asked before the season where an experienced group of defensive backs hoped to improve in training camp, Henry talked about strengthening the “two-deep,” preparing reserves to step in in case of injury. For three weeks, health wasn’t a concern for the NU secondary because Henry, Igwebuike, Harris and VanHoose started each game, backed up by Queiro, Watkins and McShepard, exactly as planned. Then, during Saturday’s contest against Ball State, Igwebuike exited with an undisclosed injury and Queiro, his backup, was knocked out with a broken arm. In stepped Terrance Brown, a junior with some experience on special teams but hardly any on defense. Brown played most of the game’s final three quarters and mostly blended in, committing no noticeable gaffes as the Cats held the Cardinals to 9 second-half points. With Queiro out for the foreseeable future and Igwebuike potentially limited moving forward, Brown could see substantial playing time on Saturday and beyond. On one hand, slotting a little-used reserve into the finely tuned defensive backfield could hinder the Sky Team. On the other hand, Brown is in his fourth season in the NU secondary, so he knows very well what the unit is all about: unity and camaraderie, with some swagger and silliness mixed in.